The driver takes you to Elephant Village and waits for your return. Elephants are a big part of Thai culture. Elephants are used in the tropical forest and as transportation of people. In Elephant Village you can meet young and adult elephants. Feed baby elephants and watch some tricks they have learned. 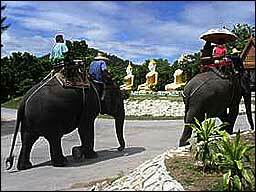 Take an elephant ride over the Hua Hin mountains. 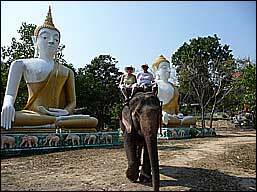 During this ride you will have stunning views of Hua Hin, ride along Buddha images and through the water. The people at the sight can help you to get on the elephant. 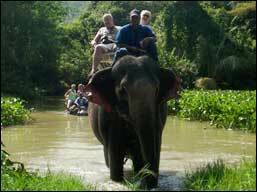 The mahout will take some pictures of you on the elephant. Afterwards the staff offer drinking water and fresh fruit. Elephants like water. You too? Price includes transfer, drinking water in the car. Price excludes rides on elephants, food for elephants, personal expenses, etc.